This picture circulated in almost all social networks on the Internet this afternoon. It's supposed to be a sign at an entrance of an upscale mall at the central business district in Makati, Metro Manila. It clearly said that no poor people are allowed inside the mall, perhaps to protect their patrons from having a not so pleasant stay in their mall because of the visible "disturbing realities." It was also a bad joke. A prank by someone or a group of people who have so much time in their hands. A dead give away was the name of the "Corporation". 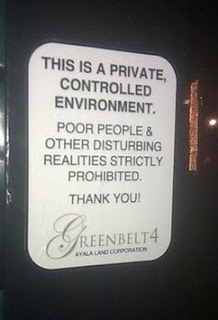 There is no such entity as "Ayala Land Corporation". It is "Ayala Land Inc" or ALI. Also, the one managing the malls is Ayala Malls and not ALI. What surprised me was the swiftness some people online passed judgement on the mall. Without even verifying from authorities whether the poster was true or not, some Filipino netizens posted angry words on sites like Twitter and Facebook. Some celebrities even joined in the fray, tweeting how they were offended by the poster. I called the people I know who work with ALI and told them about the photo. An explanation from the company came out later and also posted in the Internet. This incident should be a lesson for many of us. Although the Internet is a rich source of information, we should not believe everything we find there. We should always be discerning of whatever we pick up from the web. some people really take the internet TOO seriously!